Breast size is determined by a number of factors – principally genetic but also dietary and hormonal. Their size and shape then changes through a woman’s life depending on age, pregnancy, contraceptive pill use, weight gain or loss. Breast enlargement using an implant has been performed for over thirty years and continues to be a popular cosmetic procedure. It is designed to increase the size or volume of the breast, making it fuller. Breast Augmentation involves enlarging the breast by insertion of a silicone gel-filled bag under the breast. This results in a firmer, more projected breast. Silicone fell out of favour in the late 1980’s due to perceived issues over its safety. Instead the implants were filled with Saline or hydrogel. Saline unfortunately gives a firm feeling breast as water does not compress. They also have a high deflation rate approx 10% per year). Saline is still used if gradual breast enlargement is needed e.g. in a growing young woman with very different sized breasts or after breast cancer when the tissue might be too tight to accommodate a standard implant. Hydrogel, an attempt to compromise and get the ‘feel of silicone with the safety of saline’. was popular for a while but because of problems with these and the reduced anxiety regarding silicone safety is now uncommonly used. Newer ‘cohesive gel’ prosthesis (in which the silicone is in a ‘solid’ jelly rather than liquid form) is now the preferred type. It allays fears as to ‘what would happen if the implant split’ but more importantly it allows for a shaped implant which can be more individualized. The operation is usually performed under a general anaesthetic and takes just under two hours to do. A cut is placed either in the armpit, in the skin fold beneath the breast or around the lower half of the areola. A cut under the breast is preferred by most – it gives the best surgical access, heals well and is hidden well. A pocket is then created either directly beneath the breast tissue or under the pectoralis (chest) muscle, into which the breast implant is inserted. The implant size is based on the patient’s desires and the amount of tissue available. Once the implant is in place, the incision is closed with stitches. Dressings are minimal and usually shower proof. Supportive bras are sometimes used after the operation. A drain is placed in each breast for the first 24 hrs to stop any blood collecting inside the breast after the operation. Most women tend to stay one night in hospital following surgery although this is usually not necessary. After being discharged home, a check-up at approximately one week follows. There is some discomfort after surgery, but it is usually gone in 3 – 7 days. Bruising and swelling are often present in this period. Quiet activities should be the norm for the first two weeks. Sport and vigorous activities should be refrained from for about 4-6weeks. Complications are uncommon after breast enlargement. Bleeding, infection, delayed wound healing and poor scars are possible as in all operations. The scars from breast augmentation are approximately 5 cm in length and are positioned in such a place as to minimise their visibility. Sometimes, tight scar tissue may form around the implant, (capsule contraction), causing the breast to appear more round in shape and to feel firmer. The cause of this is not known, and it is not possible to predict in which women this will occur. This is not a dangerous condition, but can in extreme cases feel tight and sore. It is much less common with the newer types of prostheses. Prosthesis palpability – part of the edge of the prosthesis can sometimes be felt. This depends on the type, size and placement of the prosthesis and the amount of your own breast tissue that covers it. Movement of the Prostheses. Especially with a shaped implant it is important that the prosthesis settles in the tissues. Sometimes it does not do so and the prosthesis can move. This is particularly a problem if the implants are tear-drop shaped. The undermining of the breast and the stretching of its tissues by the prostheses means that some change in breast sensation can occur. This is usually a decrease in sensation although some areas of increased sensitivity can be present. This is usually most marked immediately after operation and tends to be temporary, improving over the following 3-6months. A long-term problem is rare. Breast droop – all breasts ‘droop’ with age and gravity. Generally speaking – the larger the breasts and the less their support the more they will droop with time. This is also true with prostheses. The larger the prostheses, the higher the risk of complications or compromise. This is a large factor then in choosing the size of your prostheses. 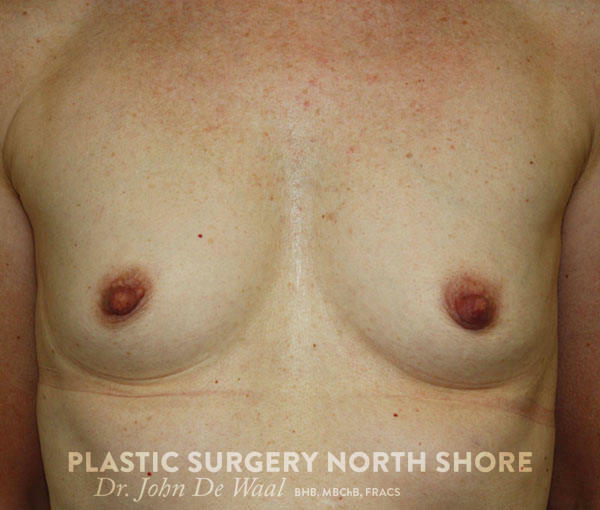 The vast majority of patients are very satisfied following breast augmentation. If a patient wants the implants removed for any reason, it can be done, leaving only the original scar. No increases in breast lumps or breast cancer have been associated with the use of breast implants. Mammograms can still be obtained after breast augmentation. As the breast tissue is not cut in the procedure, the ability to breast feed should not be altered by the operation.